For sheep and cattle. Dosage 2ml. Refrigerated Product. POM-VPS. Suspension for injection containing five strains of Clostridium chauvoei formaldehyde inactivated cells/dose and equivalent toxoid inducing ≥ 0.5 guinea pig PD90 per strain. Also contains Aluminium hydroxide as an adjuvant and 0.26 mg/dose Thiomersal as preservative. To stimulate active immunity against Blackleg (Clostridium chauvoei infection) in cattle and sheep. Significant levels of immunity cannot be expected until two weeks after the second dose of vaccine in the primary vaccination course. From experience from field use, the duration of active immunity is expected to last one year. The duration of passive immunity is at least 4-6 weeks in lambs, provided that lambs receive adequate quantities of colostrum in the first 12 hours after birth. The vaccine should be administered by subcutaneous injection in the lateral side of the upper neck observing aseptic precautions. Cattle and sheep: 2 ml/dose. Two injections separated by an interval of 3-4 weeks to animals from 3 months of age onwards. Immunisation to be completed 2-3 weeks before the period of risk. Revaccination with a single booster injection 2-3 weeks before the period of risk. The interval for booster injections should be no more than 12 months. Two injections should be given, preferably separated by an interval of at least 6 weeks, with the second vaccination being given 3-4 weeks before lambing. Subsequent pregnancies: a single booster injection 3-4 weeks before lambing. Ewes can be vaccinated during late pregnancy. Lambs may be vaccinated from 3 weeks of age onwards: two injections with an interval of 3-4 weeks to be completed 2-3 weeks before the period of risk. The vaccine bottle must be shaken well before use. Syringes and needles must be from gamma-irradiated packs or freshly sterilised by boiling for at least 20 minutes. No alcohol or other disinfectants should be used for sterilisation. The use of an automatic vaccinator is recommended. Since the bottle is non-collapsible, a vaccinator with a vented draw-off spike or similar device must be used. The instructions supplied with such equipment should be noted and care should be taken to ensure the delivery of the full dose, particularly with the final few doses from the bottle. Occasional hypersensitivity may occur. Vaccination may result in small (<10 cm) transient injection site reactions possibly lasting for up to 3-4 months after vaccination. Local tissue irritating effects of alhydrogel-adjuvanted vaccines reveal granulomatous inflammatory reactions consisting mainly of activated macrophages containing foamy cytoplasm, epithelioid cells, small lymphocytes and multinuclear giant cells. Reactions similar to those described above were observed following administration of a double dose. In any group of animals, a small number of individuals may fail to respond to vaccination as a result of immunological incompetence. Satisfactory immune responses will only be attained in healthy animals, thus it is important to avoid vaccination of animals which have an intercurrent infection or metabolic disorder. When handling animals, stress should be avoided, particularly during the later stages of pregnancy when there is a risk of inducing abortion and metabolic disorders. The nutritional and metabolic status of pregnant ewes is extremely important at the time of vaccination. If in doubt, advice should be sought from a veterinary surgeon. No information is available on the efficacy of the vaccine in young animals with maternally derived antibodies. No information is available on the safety and efficacy of this vaccine with any other veterinary medicinal product. 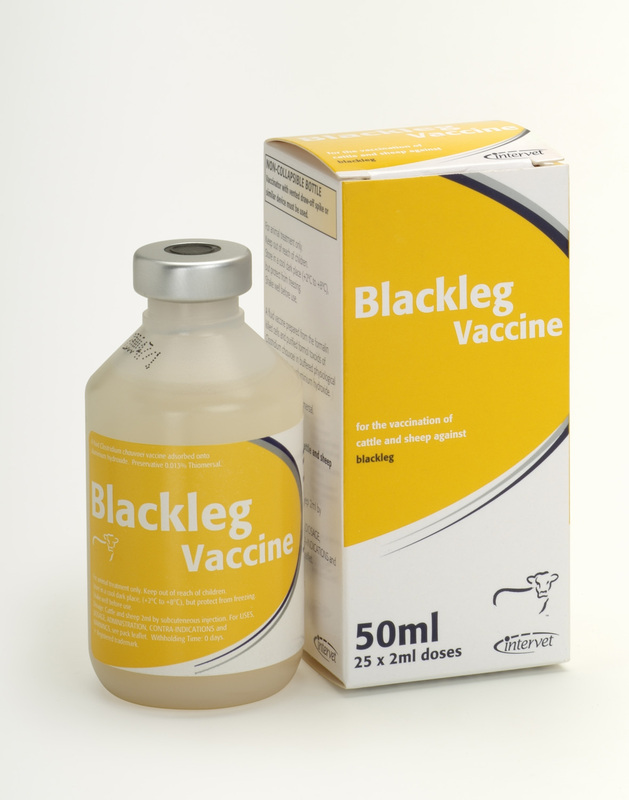 A decision to use this vaccine before or after any other veterinary medicinal product therefore needs to be made on a case by case basis. Store in a refrigerator (2°C to 8°C). Do not freeze. Shelf-life after first opening the container: 10 hours. Carton containing a 50 ml polyethylene multidose bottle, closed with a combination seal. There are currently no questions for Intervet Blackleg Vaccine - be the first to ask one!